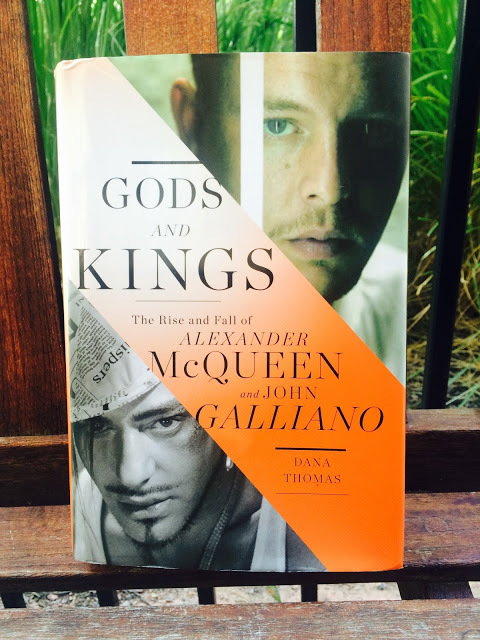 GODS AND KINGS THE RISE AND FALL OF ALEXANDER MCQUEEN AND JOHN GALLIANO is the latest book from Dana Thomas, author of DELUXE: HOW LUXURY LOST ITS LUSTER. It is an in depth look at the lives and work of two of the most gifted and skilled designers London has ever produced. Lee Alexander McQueen was and will always be one of my favorite designers and I often read about his life and work however, this was my first time reading about John Galliano. While Galliano's aesthetic doesn't always speak to me personally, I still very much appreciate his art and craftsmanship. Initially upon hearing about this book, I wondered why Thomas chose to write about these two designers together, but after just reading the introduction, it was very clear. The similarities these two shared were many; supportive mothers, romantic theatricalism, and an undeniable talent. Unfortunately, they also shared a substance abuse problem, destructive behaviors, and sometimes violent tempers. Their timelines mirrored each other so closely that it made me wonder were the similarities, both good and bad, the real recipe for their genius? In the end, both would succumb to the pressures of commerce and profits. In 2010, McQueen hung himself with a belt in his wardrobe and nearly a year later Galliano had a series of very public drunken episodes in restaurants and cafes. Thomas points out that several other prominent designers have endured nervous breakdowns, drug overdoses, and bouts of depression. The businesses of fashion and the people who run them demand a constant stream of creative production and unfortunately, the artists suffer. When the artist suffers, so does the art. With GODS AND KINGS, Thomas does an extraordinary job of shedding light on the darker side of the fashion industry, much like she did with DELUXE, and tells the stories of two brilliant artists that is equally beautiful as it is tragic.